Parrotsol is a family run business. We started up when we realized that we could not find an awning for our van which was light weight, easy to fit, was easy to store and did not cut out too much light. We have been working with various fabrics poles and eyelets and have made many prototypes which we tested and improved on until we were happy with all aspects of the design. Being motorhomers ourselves and use the products that we sell. 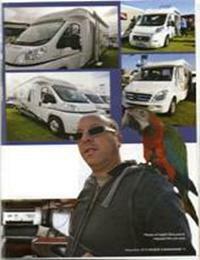 Parrotsol products are all designed for motorhomers and caravanners actual needs. We have tested all the products that we have designed on our own van, so we know that they perform the job that they were designed for. Our awning blocker panels and rooms will fit most brands of awnings including Fiamma Omnistor etc. We now keep stock of the most common sizes of panels but can manufacture custom sizes and designs to fit all vans, usually within 7 days.